Dr. Shweta Kumar, an alumna of Bharati Vidyapeeth and DY Patil dental college, Pune, is a Prosthodontist (A Crown, Bridge & Dentured Specialist) by training. She is a member of the Indian Prosthodontics Society. Dr. Shweta is your pick when you are looking for Crown and Bridge specialist in Delhi. She is an integral part of The Sterling Dental Clinic. 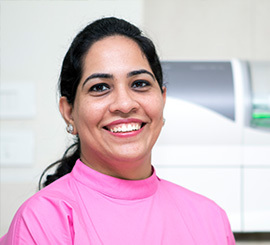 Her aim is to provide quality care to all patients and help them achieve and retain a dazzling smile. She specially likes to work with the geriatric patients understanding their needs and provide the best possible solution for their needs. She has national and international publications to her credit. She likes to participate in educational courses and workshops to keep her knowledge and skills updated.